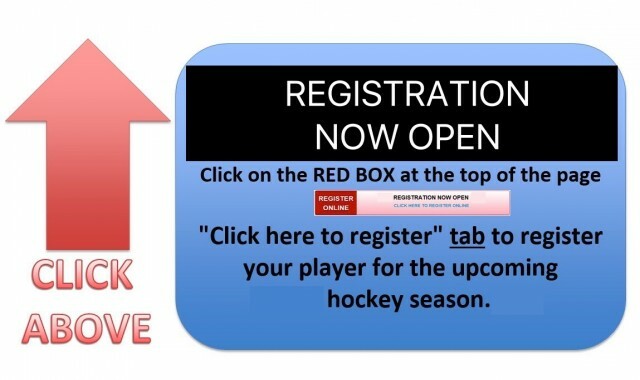 Registration for the 2019-2020 Season NOW OPEN!!! Registration for the 2019-2020 Season is now open! Simply follow the "Click Here to Register" link on our home page, or the link at the bottom of this page. If you are new to Red Circle you will be required to set up an account. If you are returning simply log in. Do not forget to finish the whole process completely and check out. We are the only league in the city that offers 2 hours of ice per week for ALL Divisions. WE ARE THE ONLY LEAGUE IN THE CITY TO OFFER FULL ICE HOCKEY EXCEPT MITE WHICH IS HALF ICE. Don't delay, sign up today!! If you wish to volunteer as a Coach or an assistant for your child's team, you MUST register in order to be considered for this position. You can find all the information to do so on the left side of our webpage under the "Coach's" tab. All divisions have 2 hours of ice per week including Mites and Tykes, excluding special circumstance such as Christmas and New Years or other special events when ice times are not available. Mites and Tykes are on the ice every Saturday and Sunday, all other divisions normally have an ice time during the week and one on the weekend. When do we Register: Online registrations are now open. We also offer in person registration each year during our Championship weekend March 30th and 31st, and usually the last weekend of August. Dates are always posted on the website prior to these dates. Early rates only apply until April 1 st, and must be paid in full to qualify. Late fees will be added to accounts with outstanding balances after the various rate deadlines. How do I register: Click on the "Click Here to Register" link on the home page and start by creating your new personal account or if you already have a Profile set up,simply sign in. Do not forget to finish the whole process, complete check out. Remember your password as you will require to sign on to your profile for your schedules. How much does it cost: Registration fees are based on birth year, the chart below gives you the cost. A Mandatory Fundraising fee of $40.00 is applicable in addition to all registration fees. Raffle Tickets will be distributed mid November after all teams have been assembled, this is where you will be able to recoup your fundraising fee. Registration Fees are due in full at time of registering unless prior arrangements have been made with the Registrar, ie taking advantage of payment programs such as Jumpstart or Kidsport. Players with outstanding balances will not be permitted on the ice. Late fees will be added to accounts with outstanding balances at the deadline times. When do they play (Schedules): Schedules will not be set until late September once we know our ice allocation and player numbers. We do know that Mites and Tykes are on the ice every Saturday and Sunday, all other divisions normally have an ice time during the week and one on the weekend. Our week day ice starts at 5 pm, our weekend ice starts at 7 am. All divisions have 2 hours of ice per week including Mites and Tykes, excluding special circumstance such as Christmas and New Years or other special events when ice times are not available. Mites is 1/2 ice, Tykes is full ice unlike the Initiation Division in some leagues. Where do we play: Our Home Rink is Stronach Arena. How do we pay: Payment may be made on line using Visa and Master Card, Visa Debit will not be accepted. Payment through other means, drop off at our Office at the back of Pad B, Stronach Arena via Cash or Money Order. Payment using Debit in person only with arrangements with the Registrar. We do not accept persoanl cheques unless certified by the bank. Player Trades: In an effort to enhance our player experience, player trades may be required in an effort to balance teams within any division. As a result the Hockey Operations Committee has the authority to trade any player as required to accomplish these goals. In addition to the above all players and parents must agree to such trades. As the Red Circle Board of Directors recognizes these trades may be unexpected, the Hockey Operations Committee has been directed to ensure each of these trades are completed in a fair manner while assisting the players and parents involved with their transition. Early rate applies to registrations on or before April 1, 2019 and are paid in full. Registrations with outstanding balances on the various deadline dates will be charged late fees. Anyone taking advantage of the JumpStart or other Community Based Subsidy programs must do so early, many of these programs run out of funds in August and September as the season grows closer. But do not forget to make the arrangements with our registrar BEFORE registering. Refund Policy: Players withdrawing prior to the start of the season (Sept. 28th) will be charged a $100.00 administration fee per player. Players withdrawing prior to November 1st will be charged a $150.00 administration fee. There will be no refunds after November 1st. Requests for all refunds must be in writing via email to the registrar and come from the person (email account) who registered said player. We are proud to be able to provide the program that we do with the lowest registration rates in the City. READY TO PLAY SOME GREAT HOCKEY??? CLICK THE LINK BELOW TO GET STARTED.